Home > Resources > Transfer > How to Transfer Contacts from Nokia to Galaxy S6? As a Symbian fan, you have used your old Nokia phone, such as Nokia 2720a-z for several years. Finally, you purchase a brand new Samsung Android device, for example, Galaxy S6 Edge. However, you just find that all your contacts are still located on your old Nokia phone and now you need to find a way to transfer them from the Nokia phone to the new Galaxy S6, so that you can share the good news with your friends. In this article, we recommend you the easiest solution to make it. 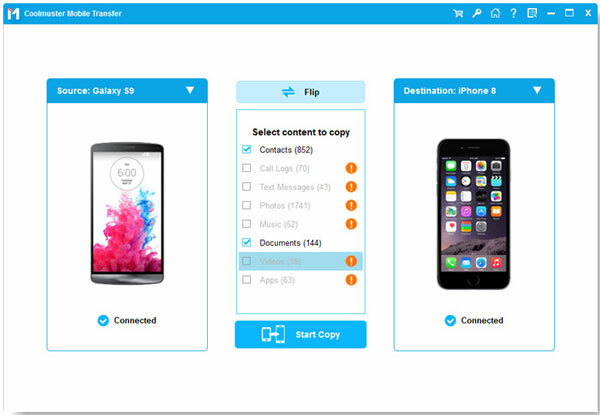 All what you need is the Coolmuster Mobile Transfer, a professional Nokia to Samsung data transfer program which can transfer contacts from Nokia to Samsung Galaxy S6/S5/S4/S3 easily and quickly with just one click, with comprehensive contact information preserved, including phone numbers, job titles, company names, email address, etc. Besides contacts, it also copies photos, videos, music and more from Nokia to Galaxy 6, and vice versa. 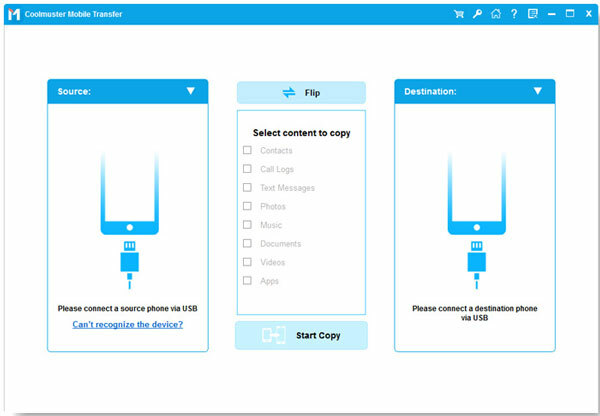 Click the following button to get the free trial version of the Mobile Transfer downloaded and installed on your computer. Then, you can read the following guide about the process of contacts transferring from Nokia to Galaxy S6. Launch the installed Mobile Transfer and you will see the main window of the program as follows. To transfer contacts between Nokia and Samsung Galaxy S6, you need to choose the option of "Phone to Phone Transfer". You will be required to connect your devices to the computer. Just use two USB cables make the connection between your Nokia, Samsung phones and computer. Then, you will see a new window with the two devices are displayed. Now, you are allowed to selectively choose the file type that you want to transfer from Nokia to Samsung. Here, you just need to check the box in front of the "Contacts" tab. Then, begin the transfer process by clicking the left or right arrow in the middle of the program interface. Note: Keep your both devices connected until the transfer is finished.